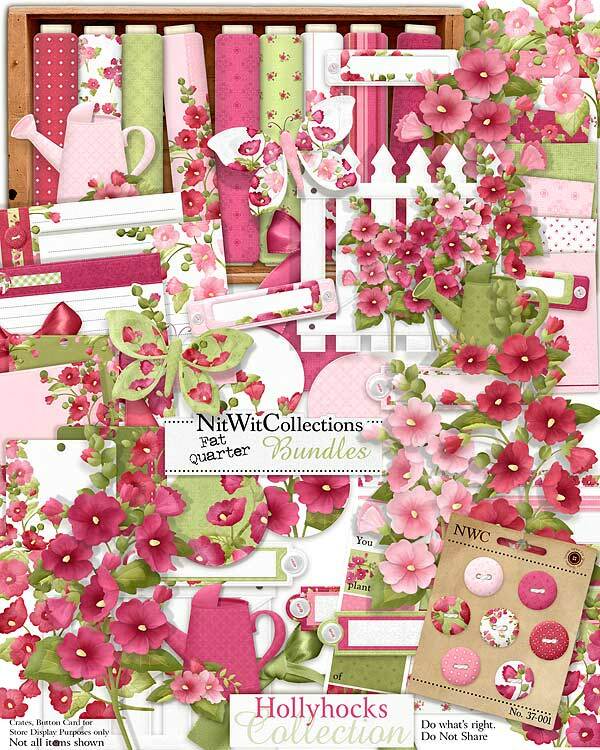 FQB "Hollyhocks" Collection will let you explore colour and texture in your scrapbooking layouts and cards, much like these flowers do for us in real life! The rich and vibrant artistry of these digital papers and elements can take you in so many directions. We chose a tribute theme for our scrapbooking layout idea that you see above, and our card making inspiration lead us to a light hearted friendship card. Also don't miss the border corner and journal card elements when making your choices, as these lean toward an almost water colour effect for these beautiful and expressive elements. Open a new blank canvas and let your eyes and heart guide you into your next creation! 5 Fabric circles covered in the coordinating papers of this Collection. See how we used them in our scrapbook layout and card making ideas above! 1 Fence completely adorned with Hollyhocks and a watering can. You can't forget to water them! 1 Journal card in red Hollyhocks...is this the colour that you chose? 10 Ribbons for you to choose from to add that perfect touch!